Guru Gobind Singh Jayanti' is a famous festival of Sikhs. Guru Govind Singh Jayanti is a public holiday. It is a day off for the general population, and schools and most businesses are closed. Guru Gobind Singh was formally installed as the leader of the Sikhs at age nine, becoming the tenth Sikh Guru. Guru Gobind Singh Jayanti is celebrated as the birthday of tenth and the last Guru of Sikhs Gobind Singh ji. 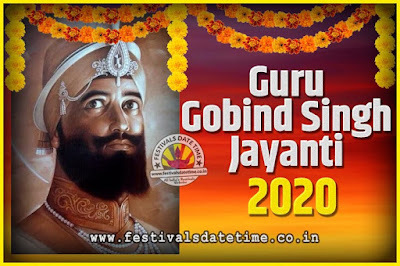 Guru Gobind Singh Jayanti generally falls in December or January or sometimes twice within a year as it is calculated according to Hindu Bikrami Calendar, which is based on the lunar calendar. The Sikh community celebrates this day offering prayers at gurudwaras and remembering Guruji's words of wisdom. People sing devotional songs during the procession and share sweets and a cold drink or a sharbat among the adults and children. Special dishes that are unique to this occasion are prepared and served during the festivities.